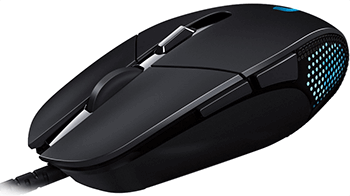 Professional-grade gaming mice are rarely one-size-fits-all, with different designs and specifications complementing different playing styles and gaming needs. In the ultra-competitive world of MOBAs, easily the most clicking-intensive genre in PC gaming, it pays to have a few advantageous features built into your hardware. With that in mind, one of Logitech’s best offerings for MOBA gamers comes in the form of the Logitech G302 Deadalus Prime, which I feel is a powerful MOBA mouse more than capable of tournament level performance. 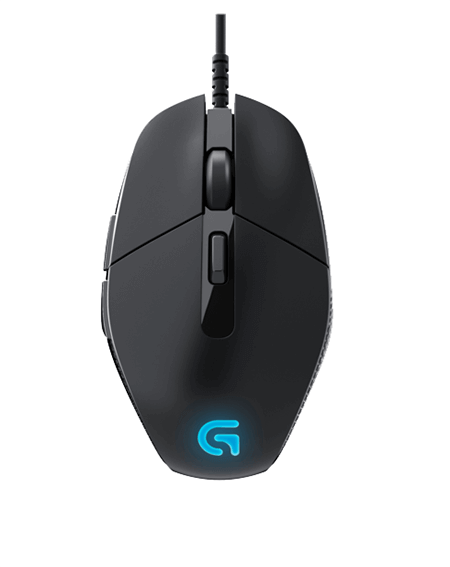 The Logitech G302 gaming mouse is a right-hand design mouse with 6 programmable buttons. However, the side buttons are only on the left, which is a bit odd, as it really could be on both. It feels just okay in my slightly large hand, although I don’t think the button positioning will give any problems to smaller handed players. The shape is a little “edgy”, literally, in that it has really annoying sharp protrusions on the side that can be extremely awkward if your hands aren’t just the right size. Switching to a claw grip will probably solve that issue, though. It’s weighted a little too much at the back in my opinion, but to each his own. The Logitech G302 gaming mouse does not feature Logitech’ Fusion technology to increase the maximum tracking speed, so you’re capped out at about 120 inches per second, which isn’t bad by any means, but nowhere near top grade. The software for this mouse isn’t bundled, and I had to download it from Logitech’s website. The options are pretty standard: button binding, profile-to-game binding, DPI cycling/shift settings, and some lighting options for the logo and sides (including a very cool breathing effect option). Actual gaming performance was pretty stellar. I had a go with it on CS:GO and the tactile feedback on the button clicks were glorious. The metal spring button tension system Logitech has been harping about in the mouse’s marketing material is certainly tangible in the product, so kudos to them for delivering something any MOBA player would be delighted with. After some light FPS it was time to put it to the real test, so we had our best LoL player, Michael, take it out for a spin in an online League of Legends match. His feedback was equally full of praise, with major compliments being its “just right” weight, great grip, and amazing button clicking experience (for all buttons). In essence, the Logitech G302 is a very capable MOBA mouse with all the right features for you to excel in your DoTA/LoL escapades. It is not without its weaknesses, but given its target market, we still rate it very highly.